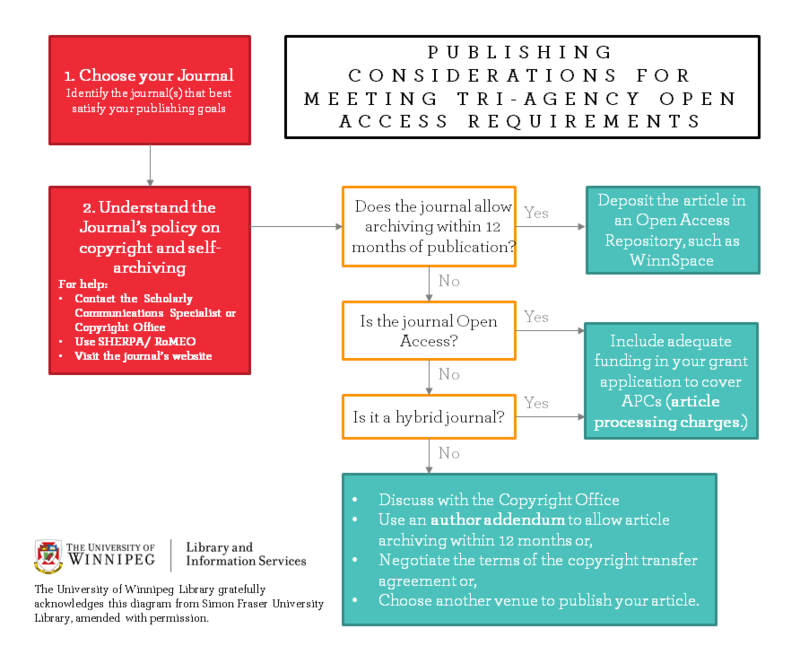 What is the Tri-Agency Open Access Policy on Publications? SSHRC, NSERC, and CIHR have a harmonized Open Access Policy on Publications that requires research publications from their grants to be made freely available within 12 months. This ensures public access to publically funded research. Please contact Brianne Selman - Scholarly Communications and Copyright Librarian, or John Dobson - Scholarly Communications Specialist. For further information, the Tri-Agencies offer both an FAQ and an online Toolbox, both with information and resources to help you comply with the policy. How can I make my publications open access? Publish your research in a journal of your choice, then deposit a version of your article in an open access repository, either one specialized for your discipline or one run by your institution such as WinnSpace. To take advantage of this option, you as the researcher are responsible for ensuring that the author agreement you sign with the publisher of the article allows you to make this deposit. Publish your research in either a hybrid (which offers both subscription and OA articles) or a fully Open Access journal. For journals that use Article Processing Charges (APCs) as a means to fund open access, these APCs are eligible expenses for Tri-Agency grants. Please note that making a version of your article available on your own website does not meet the conditions of the policy, and may be against copyright restrictions. For more information, please contact the Copyright Office.